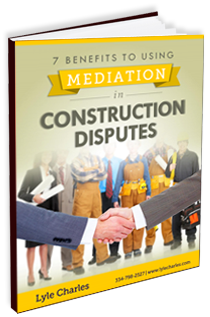 In construction mediation, having a mediator with field experience on construction issues helps the process proceed with equity, accuracy, and expertise. In addition to having more than 40 years of construction experience, Mr. Charles has received extensive dispute mediation and arbitration training from the American Arbitration Association (AAA). The ADR training Mr. Charles has received, along with examples of ADR matters he has handled, is noted below. In addition to ADR services, Lyle Charles offers business management coaching and construction claim analysis. Litigation is not always the most effective means of dispute resolution. In comparison to litigation, properly conducted arbitration can prove to be more expedient, less costly, and more confidential. For the construction industry, arbitration also offers the benefit of allowing an impartial party appointed arbitrator with experience in the subject matter to handle the dispute rather than someone with limited knowledge of the issues. Upon completion of arbitration, the arbitrator(s) render(s) a final and binding decision called an “award” which, with very few exceptions, can be enforced similar to a court’s judgment without the chance of appeal. This offers a highly satisfactory and “final” resolution to the parties in a dispute. Few construction consultants can boast the level of experience that Lyle Charles has. He brings his 17 years of experience in the construction, commercial contracting, and steel fabrication industries to the arbitration process by offering his arbitration services through the American Arbitration Association. He has served as a sole arbitrator, panel member arbitrator, and party appointed construction arbitrator. He also offers construction claims management services and business turnaround.